We’ve had some ups and downs since the last post. On the downside we were unsuccessful with one of our significant funding bids. This was funding towards the Street Art work on the shutters; it’s disappointing as this is a significant part of the project however it’s understandable with funding limited for community projects and charities you can understand funding decisions when you have to decide between projects that feed people and keep them well against a project that was to pretty up its local area. But that won’t put us off, we are waiting on the outcome of another funding application and we have found other sources of funding that we’re be exploring over the Festive period. Trafford Council have signed the agreement with Openreach so we can begin the process of decorating the BT exchange boxes in the area. Our artist Rob Stadtmuller will be working with the Gorse Hill Scout troop to develop designs for the exchange boxes and will start the work in the New Year. It’s a really exiting initiative and rather unique for Greater Manchester so Gorse Hill will not only be gorgeous but a trailblazer! Come along to our final meeting of 2013 on Wednesday 18th December at 7pm in the Talbot Rd site of Stretford Leisure Centre. 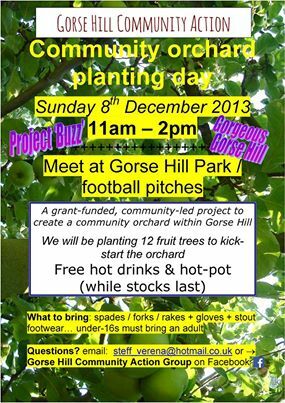 And finally back to those apples, come along to the orchard planting on Sunday 8th, this is a significant strand of the Gorgeous Gorse Hill project and really fits with the potential to model Todmorden (yes you read that right), there Incredible Edible initiative is really inspirational. It might be cold but wrap up and bring a spade and warm yourself up.